Similar to farmed animal, natural organic kangaroo dog treats can be made out of almost any part of the roo’s body. If you are a vegetarian this might make you feel a little squeamish, but I still know conscientious dog owners who believe in genuine nutrition and understand the importance of meat in their dog’s diet. With the kangaroo its pretty much Australia’s biggest organic healthy clean resource secret that only a few dog owners are in on. And it will only remain affordable until big overseas exports kick in. If you do know about kangaroo treats and have bought them, you probably have knowledge of roo jerky and the basic kangaroo clod bone. Little did I know when I began in this industry how many different kangaroo bones could be sold for dog treats let alone all of the other parts. Roo bones like the rest of the roo have the advantage of high quality fat/ oil in the marrow. Agree or disagree with the current Australian Government quotas sanctioned by scientists to enable sustainable mob levels, most people don’t realise that across Australia only about one third of the total quota for any year is typically realised. The other thing to consider is that once a kangaroo is culled it can either be used by humans and the other parts used for our dogs, or it can be turned into a low value product like fertilizer, or maybe even wasted completely by being buried. 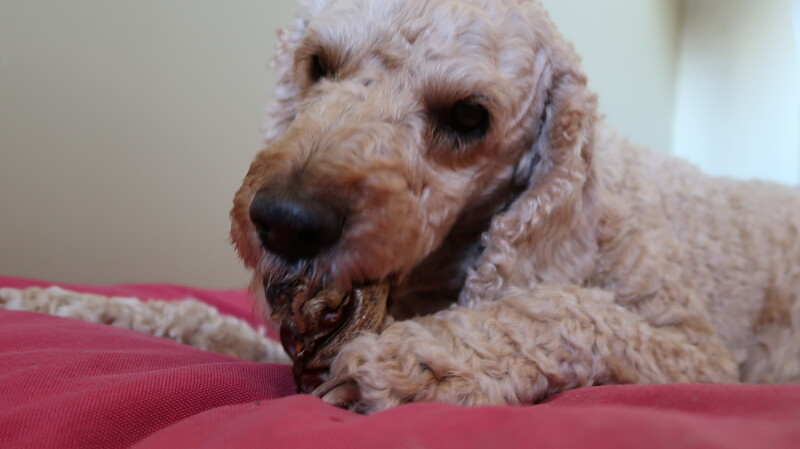 We continue to add many various kangaroo dog treats to our healthy dog treat arsenal, but after all these years I have only just found that there is an equally good, but cheaper version of the ‘Rolls Royce’ of roo treats – the kangaroo tendon. While the tendon is often expensive or elusive (out of stock) a ‘new product’ we have just discovered is the wonderful kangaroo cartilage. Where people often get confused with the term cartilage, is when you look at beef products, beef tendons tend to be hard but potentially brittle blades of hard chewing bone like matter. They don’t look like meat and are mostly for the big chewing dogs.